T14 class No 461 heads west passing the ‘daffodils’ appearing on the embankment between the main line and 21c159 “Sir Archibald Sinclair” waiting on shed. May the angels protect you, may the sadness forget you, may goodness surround you and may your God always bless you. The budding trees, the new flowers, and birds that sing, whisper to me that it’s Easter, that and supermarkets full of chocolate of all shapes (many irrelevant), sizes and special offers! Here is wishing a warmth in your firebox for your soul on Easter & always! 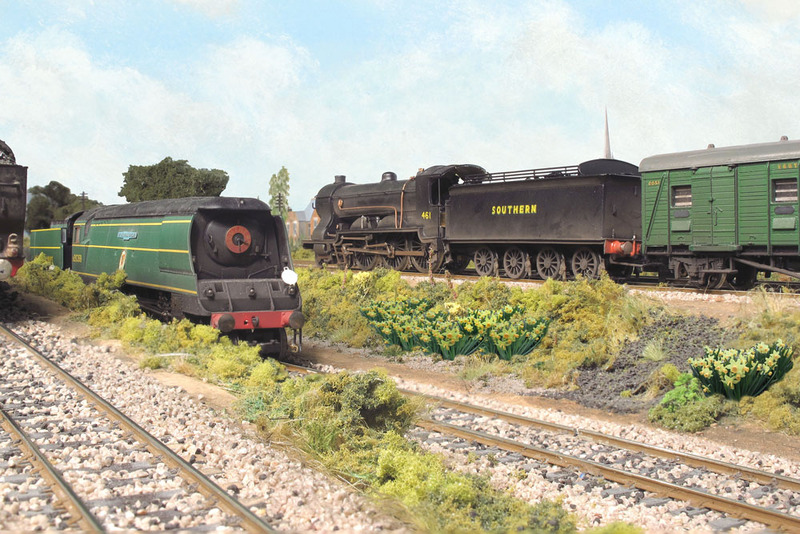 Bulleid Light Pacific, Battle of Britain 21C151 ‘Winston Churchill’ is turned at Fisherton Sarum. Hornby have today announced their full range for 2017. As with the range for 2016 new tooling announcements fro 2017 have already been made during the last year via their informative Engineshed blog and a presentation /launch at the Warley National Model Railway Exhibition. These from a Southern Railway perspective has already included the announcement last September of the ex SECR 0-4-4T H class Tank. [Updated 13/01/17] R3566 – BR 4-6-2 ‘British India Line’ Rebuild Bulleid Merchant Navy Pacific number ‘35018’ has been changed to be 35014 ‘Nederland Line’ due to the unique detail differences of 35018 as the pioneer rebuilt of the class. [Updated 16/01/17] Confirmation that R3568 – BR Class 71 ‘E5018’ will be in BR Green Livery with plain green ends. The range also sees a welcome reintroduction of the Bulleid 0-6-0 Q1, Light Pacific Classes; both Air Smoothed and rebuilt, and reverse SR / BR liveries for the two excellent Diagram 1529 and Diagram 1530 SR Cattle wagons introduced last year. The aim of this post is to round up the announcements that are of a Southern Railway / Southern Region interest, it should be noted that as I advised here a number of the 2016 range announcements have already been moved into the 2017 range for release, Including the original Bulleid Merchant Navy Pacifics (detailed in my post here) and these items are highlighted below by a Red [*]. An indication of the planned release date via the Quarter system (eg [Q2] is also provided. My version of how R3525 s21c159 will look (but not weathered). In addition to the ex SECR 0-4-4T H class tanks Hornby’s new tooling for 2017 comprises of LMS 4-6-2 Modified Princess Coronation Class, BR Class 87 Electric locomotive (including R3582 number 87010 ‘King Arthur ‘) and the latest Hitachi soon to be introduced on the UK network IEP Bi-Mode Class 800/0 units. Although the 2017 range includes a number of post war Southern liveries, suiting the period I model, I would add that as far as I am aware that has not been due in any way to my influence. It is good to see that Hornby, with a little advice, understand and acted upon the need to produce SR / BR(s) coaching stock to make up suitable set formations. The sets chosen by Hornby for the Maunsell high window style being 243 and 247 in SR and BR liveries respectively were two of the seven four coach sets 241 to 247 formed between March 1932 and April 1933 for use on the South Western section. A further release of the high window version of the Maunsells has been very often requested and these are the most logical sets to choose of that type of restriction 4 coach (as opposed to the narrower Hastings line stock of the same period) as other sets of that type comprised of a greater number of coaches so this creates correct and easily achievable sets. Hornby’s new coach tooling for 2017 comprises of BR Mk 1 Brake Standard Open (BSO) and First Open (FO) coaches neither of which are being produced in BR(s) green this year. Note: the 2017 Hornby Catalogue has incorrectly transposed the diagram numbers in its headings for these cattle trucks but the illustrations are correct. Hornby’s new wagon tooling for 2017 comprises of a GWR 20 ton Diagram AA15 ‘Toad’ brake van. The full Hornby 2017 range can be found on the Hornby website here. The issues affecting Hornby over the last few years has been well publicised and discussed elsewhere but this range, including items carried over from 2016 and the slightly fewer new tooled models for this year shows the practical and conservative approach being taken by the new management team. I hope that this and their apparent positive re-engagement with the retailers will hopefully lead to a prosperous 2017 for all. May the angels protect you, may the sadness forget you, may goodness surround you and may your God always bless you. The budding trees, the new flowers, and birds that sing, whisper to me that it’s Easter. Here is wishing a warmth for your soul on Easter & always!